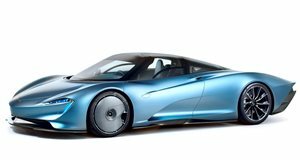 McLaren may not have revealed any new models at this year’s Geneva Motor Show, displaying the Speedtail, 720S Spider, and 600LT Spider by MSO, but that hasn’t stopped the automaker from providing a tantalizing glimpse into the future. In a surprise announcement, McLaren has confirmed it will launch a new luxury grand tourer this year that will be sold as a separate model outside its existing Sports Series, Super Series, and Ultimate Series ranges. Details are scarce for now, but the company’s CEO, Mike Flewitt, teased it will be the "McLaren of Grand Tourers.” A single teaser image of a camouflaged prototype previews the car’s sleek body. "The fourth McLaren to be introduced under the Track25 business plan will be our interpretation of the Grand Tourer. It will be a car that combines competition levels of performance with continent-crossing capability, wrapped in a beautiful lightweight body," said Flewitt. McLaren also confirmed the car will feature a spacious interior with high-quality materials and will be the "usable mid-engined car yet.” A video also confirms McLaren's new grand tourer will be mid-engined and feature similar horizontal taillights as the Speedtail hyper-GT. Further details including the name of the mystery model will be revealed in the coming months, so stay tuned.